PRODUCT: FastPatch EJC-25 Self-Leveling Joint Sealant. 2-Component Rapid-Setting Flexible Polyurea Based Sealant for Expansion / Control Joints. Fuel Resistant. Class-25 Expansion with 800% Elongation handles joints to 2 inches wide (see data sheet). Dual 300ml X 300ml Cartridge Sets. 12-Sets/Case. Price/Case. DESCRIPTION: PolyQuik EJC-25 is quick-set self-leveling expansion joint / crack repair product. Very Fuel Resistant (splash and spill fo jet fuel, gas, diesel)). Its designed for rapid repairs on concrete slabs, containment facilities, gas stations, roadways, bridges, sidewalks and airport runways. Its 800% elongation, highly elastic, self leveling, flexible at freezing temperatures, 100% solids, 0 VOC. 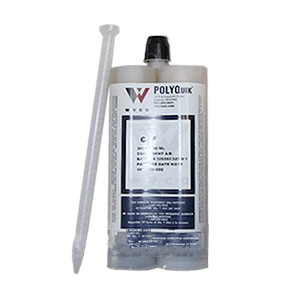 PolyQuik EJC-25 can be used to seal cracks, expansion joints and control joints from 1/4 to 1 inch wide and up to 25% joint movement. For expansion joint movement greater than +/- 12.5% of original joint width (or 25% total joint movement), concrete priming is required. Prime with POLYQuik® IK Primer, POLYPrime or an Epoxy Primer. Meets Standards: Type M, Grade P, Class-25. Fuel Resistant: Outperforms Silicones by 200-400% in JP-8 Jet Fuel Soak Tests. Recommended for splash and spill applications. 12 Cartridge Sets: 300x300 ml Dual Cartridge (1:1 ratio)/set. 1 Mixing Tubes per Set, 12 total included. APPLICATION SUMMARY: See DataSheet for Details. SHAKE Cartridges WELL before opening.